Turn summer's berry bounty into something yummy! 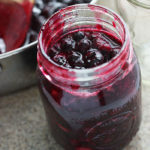 Homemade blueberry pie filling is so simple to make and even easier to preserve for a rainy day. Combine blueberries and sugar in a large saucepan over medium heat. Bring to a boil. Cook until blueberries become soft and start to release their juices, about 10 minutes. Combine the lemon juice and cornstarch. Pour into the blueberries. Continue to simmer until the juices begin to thicken, approximately five minutes. Remove filling from the heat. Pie filling will continue to thicken as it cools.